It goes without saying that yesterday was probably when the town had witnessed one of its most successful mini-projects. 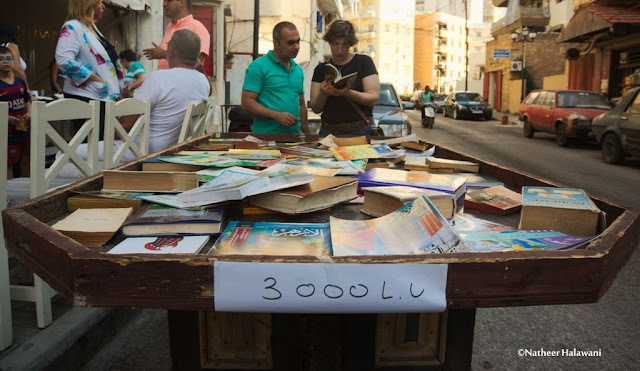 It was that Samer, the Tripolitan professor at a renowned university in town, and the activist if I may call him, had wanted to put to use the available resources in order to bring books back to life, and hopefully promote for a new fashion for reading them. Samer, and through the Cultural Agenda, made ties with a few fellows and created what is now known as the “El Mina Book Market”, the first of its kind in Mina (Tripoli’s very own sea port) where used books are sold, bought and exchanged too, all in the sake of gathering enough money to send children back to school. 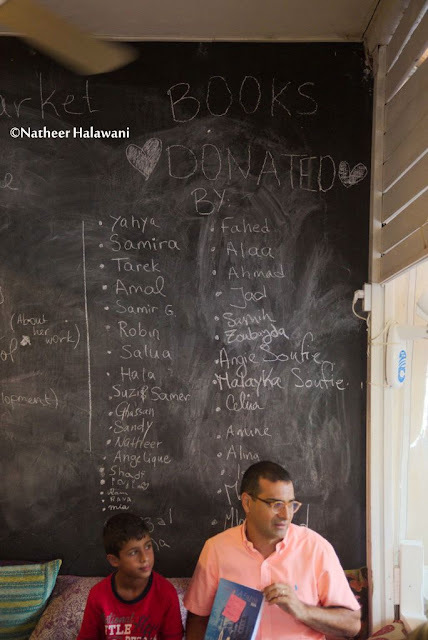 The event was held in non-other than Rassif café, the roadside coffee shop that, I believe, had excelled in marking a new footprint and raising the bar for all future coffee shops in town. As you might be able to notice from the photos, the books were so diversified I was baffled myself. You could see the quran and the tales of the Sahabas right next to a communist book, a German novel or the bible itself. 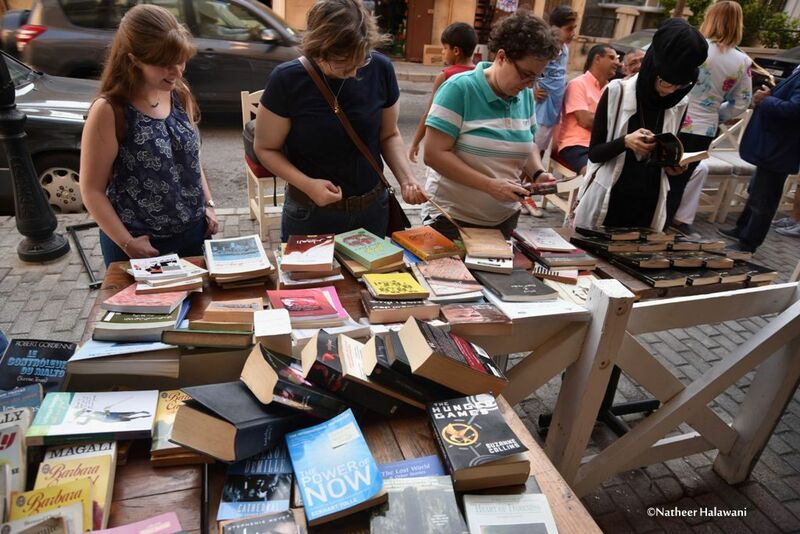 Aside from the books themselves, it was worth mentioning that the organizers had made a wonderful move by inviting a couple authors to the market, in order to exhibit books of their own too, namely Yahya Mawloud and Michel Baghdadlian, both of whom had been dearly celebrated. The event, as Samer had stated earlier, would take place once a month, which is also the time by which readers would have to return the book they borrowed on the event before. And yes, there was a section for Not-For-Sale books, also known as “Exchange books”. Books have found a new spot to be exhibited other than the city’s yearly “Book Exhibition” which I dare call “very poor”. People have found what quenched their thirst for an active startup-society of readers and like-minded fellows. What was more surprising was when two neighbors met at the book market not knowing how much of a book worm the other neighbor was! It’s a humanitarian cause at the end of the day. All the best for the Cultural Agenda and all helping hands, the best is yet to come. Follow our trades NOW & earn up to 270% daily. The Dusty Wyndow Blog by Natheer Halawani is licensed under a Creative Commons Attribution-NonCommercial-ShareAlike 3.0 Unported License. NewAgeBaby - The Art of Being Mother. All Rights reserved to the Publisher N. Halawani (C). Picture Window theme. Powered by Blogger.